Effigy Council is still accepting proposals, but only until January 15th. That’s tomorrow! My, how time flies. If your imagination sparks to life at the thought of contributing to our Effigy in 2019, then check out the details and submit your application. Apply for an Art Grant! We are very excited to announce that there will be a total of $35,000 available in art grants for new projects to be created this year. If you haven’t heard, this year’s theme is ’Summerween’. We hope this will inspire you to develop some dramatic and interesting proposals. We will also focus $500 in art grant funds specifically for our young participants. Art grants will be open to submit beginning January 19th through February 17th at 1 AM EST. Results of your submissions will be returned no later than March 15th, so get them wheels a-turnin’, designs a-drawin’, and applications a-submittin’! All information can be found at the Art Grants page starting January 19th. This is a friendly reminder that our ticketing process has changed for 2019. Please see our Ticketing Process page for full details including transferability of tickets, theme camp tickets, low-income tickets and more. Below are some ticketing dates that may interest you, including new information for volunteer tickets. Lottery registration will begin on February 2nd, 2019 and remain open until February 23, 2019 (1 AM eastern time). We do not anticipate a fire sale this year. Volunteer tickets will go on sale January 19th, 2019 and must be purchased by February 23, 2019 (1 AM eastern time). 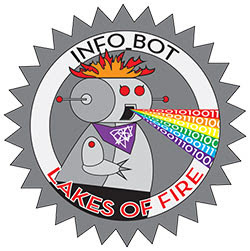 Eligible volunteers from Lakes of Fire 2018 will receive an email containing an individual code and detailed purchase instructions by January 21st, 2019 (1 AM eastern time). If you have questions about your volunteer hours, ticket eligibility, or changes to your contact info, contact your team lead first. If you have not received your offer email byJanuary 22nd, 2019, please use the Volunteer Ticket Inquiry Form (which will remain closed until then). We will be sending out offer emails until then, so please do not send inquiries until January 22nd. A big welcome to our newest board members Mike Little, Laura Thompson, Megan Smith, and Scott Kennedy! They join Nuri Gocay, Jessica Baile, and Scott Van de Vyver in leading the Board into 2019. Stepping down from the Board this year are Weston Stiegelmeier, Mary Green, Bo Lawler, and Matt Kreuzwieser. Thank you! You gave all of us your time, representation, commitment and leadership. All standing O jokes aside, you’re great and we are grateful. All things must change, and that includes our volunteer leadership! Ross has stepped up to the plate to be your new info_bot lead, as bk and Skennedy retire from that position after years of loving information dispersal. Don’t worry, info_bot will still be “consensually informative” and “nice as f***” with Ross at the helm. Please feel free to reach out and thank them if they’ve made a difference in your Lakes of Fire experience.